Post-traumatic stress disorder (PTSD) is something impacting more people, and new research suggests that mindfulness helps PTSD. Most often people think of soldiers returning from war who are the most prone to PTSD. Warriors are on the front-lines of war with explosions, killing, and more that could never be imagined from an ordinary civilian life. PTSD is something that persists. Often times the ramifications of PTSD could go on for years with no full recovery back to the previous state before the trauma. Trauma has a significant impact on the brain that has lasting, long impact, according to research by Arieh Shalev, M.D. There is new ammunition as mindfulness helps PTSD. New research has revealed that a deeper understanding of thoughts and feelings through mindfulness helps PTSD. The teachings help to have Veterans and others to focus on the present moment rather than dwelling in the trauma and unchangeable events of the past. The shifting of the brain moves away from the destructive ruminations and into the present moment that has the potential positive impact on the brain. “PTSD is really a different way of seeing the world, and is also seen at the level of physiology,” says Tony King, an assistant professor of psychiatry at the University of Michigan. Through the proven teachings of cognitive behavioral therapy (CBT), people can have a deeper understanding of their thoughts, behaviors, and emotions. CBT is one of the most widely accepted methods of care to improve people’s conditions particularly as it relates to stress and trauma connected to PTSD. As part of an online CBT program developed in partnership with the National Science Foundation, Chicago-based Prevail Health Solutions has incorporated different teachings of mindfulness into its clinically effective program that has been named a ‘success story’, and mindfulness helps PTSD. 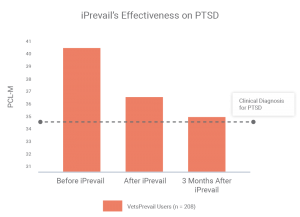 By working with one of the most severely impacted segments of society from trauma, Veterans, Prevail has demonstrated that its technology is as effective as traditional methods of care through a published randomized clinical trial. Interested to find out how Prevail is helping the battle against PTSD? Find out on the Veterans skirmish here or civilian war at iPrevail here.